Choosing your dorm bedding is one of the most important choices you’ll make during your college career. Is it more important than which major you select? Well…that might be taking it a bit far. But the point is, your bedding for college will be with you for at least four years and even beyond. Do you know what four years of bad sleep will do to you? Let’s just say we hope you like coffee! While all of DormCo’s Twin XL bedding for college will leave you more than adequately comfortable, we’re especially proud of our exclusive College Ave Designer Series Comforter Sets. These XL Twin comforter sets are only available right here, and we’ve recently added a ton of new designs and colorways. You’ll find some dorm comforter sets that look nice and some that claim to provide the best sleep of your life. It’s that combination of design and comfort, however, that DormCo achieved with these twin xl comforter sets that really sets them apart. 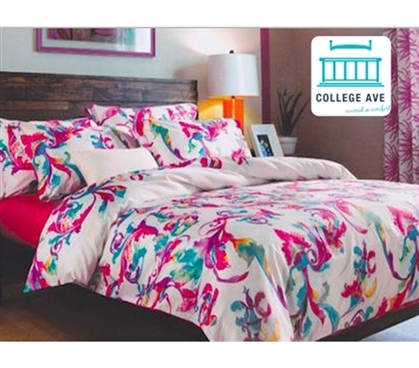 Beautiful college bedding that grants you plenty of beauty sleep each night is just what you’ll need to make the best out of those college years. All of the XL Twin bedding sets in this series are made from 100% cotton or 100% Microfiber. That means the college comforter, the coordinating sham, and the matching sheets (which most of the comforters sets include as an available add-on) are all super soft and comfy. You know cotton is plenty soft and comfortable, but it’s also a great material for college life. It’s machine washable and is a good, durable fabric that’ll make it through your school years and beyond. That trusted dorm bed will frequently serve as a couch for visiting friends and will be used as extra storage space during the day. Because of this, you don’t want a material that’s too dainty or difficult to clean. Calm Breeze Twin XL Comforter Set that has gentle colors and a pattern that induces calmness and sleep. No matter what you’re looking for, there are sure to be several of these great twin extra long comforter sets that catch your eye. These comforter sets for college aren’t all about flowers and looking pretty, however. Yes, guys need dorm bedding supplies too, and most guys probably don’t want a ton of pink flowers all over their bedding for college. We have the Cityscape Gray Twin XL Comforter Set and Sunny Day Twin XL Comforter Set that feature more straightforward but still engaging and cool designs that will bring a little color to that bland dorm room.